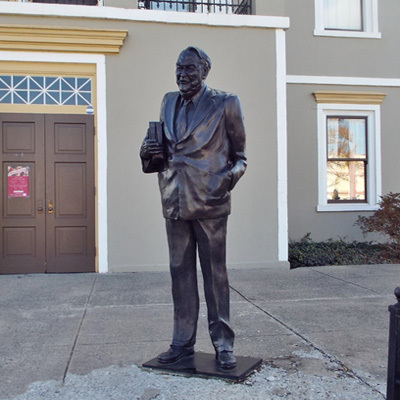 The memorial to Senator Sam Ervin, Jr. is a life size bronze statue. Ervin is shown with a smile on his face and wearing a suit and tie. His proper left hand is in his pants pocket while the right hand is holding a partially open book with one finger inserted inside. The statue stands on a concrete courtyard just to the right of the south side entrance into the Historic Morganton County Courthouse. A broad walkway leads from the street to the courtyard. Laid into the walkway are two stone plaques with quotes from Irvin and a brief biography. Flanking the walk on both sides is a memorial Rose Garden to Robert “Bob” Byrd. Sidewalk plaque #2: “OUR GREATEST / POSSESSION IS NOT THE VAST / DOMAIN, IT’S NOT OUR BEAUTIFUL / MOUNTAINS, OR OUR FERTILE PRAIRIES, OR / OUR MAGNIFICENT COASTLINE. IT’S NOT THE MIGHT / OF OUR ARMY OR NAVY. THESE THINGS ARE OF GREAT / IMPORTANCE. BUT IN MY JUDGEMENT THE GREATEST / AND MOST PRECIOUS POSSESSION OF THE / AMERICAN PEOPLE IS THE / CONSTITUTION.” / SAM ERVIN, JR.
Rose Garden plaque: ROBERT E. BYRD / (1930-202) / THESE ROSES ARE PLANTED / IN MEMORY OF BOB BYRD TO RECOGNIZE HIS / LIFETIME OF GIVING AND SHARING WITH OTHERS. / ATTORNEYS OF BYRD, BYRD, / ERVIN, WHISNANT & MCMAHON, P.A. Burke County, Historic Burke Foundation, Inc.
Sam Ervin, Jr. was a United States Senator for 20 years who gained prominence in the early 1970’s as chairman of the Senate’s Watergate Committee. Ervin was also a highly decorated World War I soldier and Harvard Law School graduate. 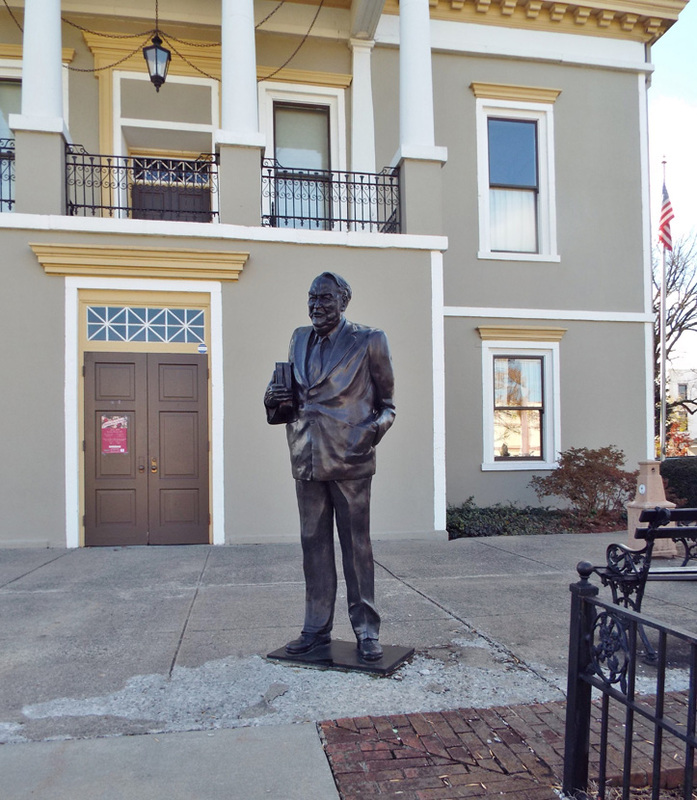 The statue is located on the south side of the Historic Burke County Courthouse, which is located at 102 East Union Street, Morganton, NC. The Burke County Confederate Monument stands on the northwest corner of the courthouse grounds and the Burke County Charters of Freedom Memorial is located on the east side of the courthouse which now houses the Historic Burke Foundation, Heritage Museum, and the Visitor Information Center. The statue stands on a paved walkway leading to the main entrance to the courthouse building.